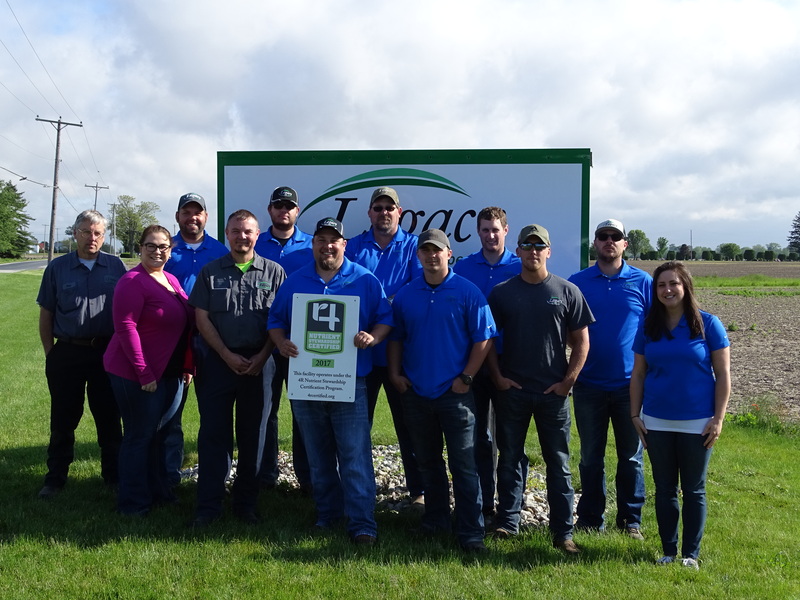 Continuing its commitment to improving water quality in the Western Lake Erie Basin, Legacy Farmers Cooperative in Custar, Ohio has achieved certified status for year three through the 4R Nutrient Stewardship Certification Program. With the program in its fourth year, Legacy Farmers joins a growing list of retailers to achieve year three certification. “Legacy Farmers Cooperative sees the importance of this program and take very seriously our responsibility to use best management practices in the recommendations and application of nutrients for our members, customers, and communities,” said Mark Sunderman, president and CEO of Legacy Farmers. Legacy Farmers Cooperative provides a wide variety of services across five Ohio counties. The company’s 10 grain facilities are able to market and handle grain, in addition to its five agronomy locations. The co-op serves the Hancock County area with its petroleum delivery service, featuring petroleum and lubricant products for farm, residential, commercial and industrial uses. Legacy Farmers also manages two petroleum cardtrol fuel stations, operates a Lawn and Pet Retail Store, and provides Turf & Ornamental Products. The 4R program certifies nutrient service providers in the Western Lake Erie Basin and across the state of Ohio that apply or make recommendations are doing so in accordance with 4R Nutrient Stewardship principles – which refers to using the Right Source of Nutrients at the Right Rate and Right Time in the Right Place. Program participants must go through an annual, independent, third-party audit and demonstrate they not only understand 4R principles, but also follow them. The program outlines an initial three-year plan for nutrient service providers, with cumulative requirements for each year of certification. For more information on the yearly requirements, visit 4rcertified.org/how. Approximately 2.7 million acres and more than 5,500 grower customers are serviced by the 37 facilities in Ohio that have earned 4R Nutrient Stewardship Certification, with approximately 70 percent of those acres located in the Western Lake Erie Basin. The 4R Nutrient Stewardship Certification Program is governed and guided by the Nutrient Stewardship Council, a diverse set of stakeholders from business, government, university and nongovernmental sectors with a common goal of maintaining agricultural productivity while also improving the quality of Lake Erie and its contributing watersheds. The program is administered by the Ohio AgriBusiness Association. For more information, visit 4Rcertified.org, email info@oaba.net or call 614-326-7520.